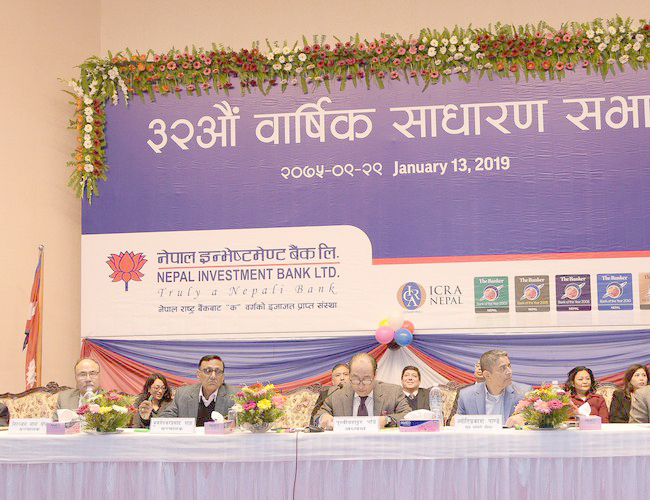 Nepal Investment Bank Ltd (NIBL) held its 32nd annual general meeting (AGM) on 13 January. The AGM approved the proposal of distributing 40 percennt % dividend – 18 % stock dividend and 22 % cash dividend – on its total paid-up capital to its shareholders. In the last fiscal year, the Bank earned operating profit of 4.95 billion rupees as compared to previous year 4.68 billion. The net profit of the Bank for FY 2074-75 is 3.65 billion rupees. 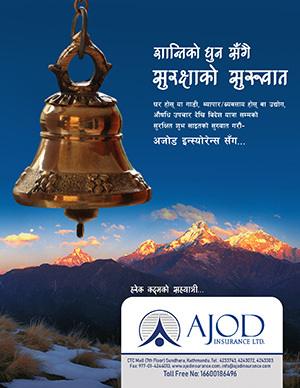 The Bank’s paid-up capital will reach 12.58 billion after issue of 18% bonus share for FY 2074-2075). In FY 2074-2075 NIBL’s deposits have increased by 11.45 %, reaching 140 billion rupees. Total lending of the bank increased by 14.44 % reaching 120 billion rupees. The Bank has more than 9 lakhs customer base catered from its 78 branches, 8 extension counters across the country.